The Dodgers battle the Braves and the Pirates face the division-rival Cardinals for the right to advance to the NLCS. Remember, as always: All predictions are for entertainment purposes only. It’s true, kids: The Braves were once a force to be reckoned with in the postseason. Way back in the 20th century, they even won a few playoff series. Sure, they won only one World Series during the 1990s, but they played in five of them. From 1995 to 1999, they won five National League Division Series in a row. But the third millennium has not been kind to them. In 2002, the Braves won 101 games during the regular season but lost to Dusty Baker’s San Francisco Giants in five games in the NLDS. In 2003, the Braves won 101 games but lost to Baker’s Chicago Cubs in five games in the NLDS. They lost in the NLDS again in 2004, and again in 2005, and again in 2010. Last year they lost the NL wild-card game. Since bouncing out of the NLCS in 2001, the Braves have lost seven consecutive playoff series. Only the Cubs have suffered through a longer playoff series losing streak. Check out Grantland’s 2013 postseason offerings. The Dodgers have spun their own tale of postseason woe since their shocking world championship win in 1988, when Kirk Gibson entered the sports lexicon forever and Orel Hershiser earned Sports Illustrated‘s Sportsman of the Year honors. The Dodgers’ upset victory over the A’s understandably used up a quarter-century’s worth of good fortune; the Dodgers would not win another playoff game for 16 years, getting swept out of the NLDS in 1995 and 1996. After taking a single game from the Cardinals while losing the 2004 NLDS, the Dodgers again got swept in 2006. In 2008 and 2009 the Dodgers advanced to the NLCS, where they lost to the Phillies in five games each year. One of these teams will add another chapter to its book of playoff disappointments, which is a shame, because on paper these are two of the playoff teams best suited for a short series. The Braves’ top three starters are a testament to a player development operation that continues to hum two decades after John Schuerholz and Bobby Cox turned Atlanta into the game’s model organization. Medlen, Minor, and Teheran are all home-grown starters, and they’re all 27 or younger. Teheran would be the favorite to win Rookie of the Year if he pitched in the American League, and he’s Atlanta’s no. 3 starter. But the Braves have struggled to find a fourth guy ever since Tim Hudson went down with a fractured fibula in July, and their tentative plan for Game 4 is to start Garcia, who has posted only one sub-4.00 ERA since 2005. The Dodgers, conversely, developed just one of their starters — but he happens to be the best pitcher in baseball. That might actually be selling Kershaw short; given his age (25), experience (182 major league starts), and pedigree (2.60 career ERA), he is probably the best starter Major League Baseball has seen since Pedro Martinez and Randy Johnson began their slow fades a decade ago. Kershaw is 25, and he has won three ERA titles in a row. Only four other starters (Greg Maddux, Roger Clemens, Sandy Koufax, Lefty Grove) have ever won a league’s ERA title in three consecutive years … and all of them had turned 26 before their streaks started. Basically, when we account for the different eras — pitchers today don’t throw 300 innings, but they also don’t throw from mounds 15 inches high to strike zones that span from the knees to the armpits — Kershaw is Koufax. And so he’s the Dodgers’ Game 1 starter. Their Game 2 starter, Greinke, has been worth every penny of his $147 million contract since returning in May from a broken collarbone inflicted by the Padres’ Carlos Quentin. Greinke’s numbers represent a bounce back after three mediocre seasons from 2010 to 2012, but let’s not forget that in 2009, Greinke won the AL Cy Young award with the highest bWAR (10.4) any pitcher had posted since 2002. Ryu is the Korean, evolutionary version of David Wells: a portly but surprisingly athletic left-hander who pumps strikes and doesn’t beat himself. And like Anibal Sanchez a year ago, Nolasco was traded from the Marlins to a contender at the midseason point and has put together an impressive free-agent portfolio. If nothing else, Nolasco is a darn sight better than Garcia. The Braves have a good playoff rotation. The Dodgers have a great one. Both of these lineups are in flux and subject to change. The Dodgers will be without Matt Kemp for certain, and Andre Ethier’s availability is iffy, which forces Schumaker into the lineup. The Braves finally got tired of looking at Dan Uggla’s .179 average and terrible defense and are taking him off the playoff roster entirely, leaving the starting job to Johnson, who was claimed off waivers just six weeks ago. The Dodgers’ lineup is top-heavy, but it’s one hell of a top. Puig was the best rookie hitter in the majors this year and one of the most remarkable talents the game has seen in a while. Ramirez posted the highest OPS (1.040) of any NL player who batted 300 or more times, and he plays shortstop. Neither Ramirez nor Puig played a full season in the majors, but they’re here now and they’re healthy. They’ll give the Braves a handful. But after Uribe in the no. 5 spot, there’s just not a lot of bite there. 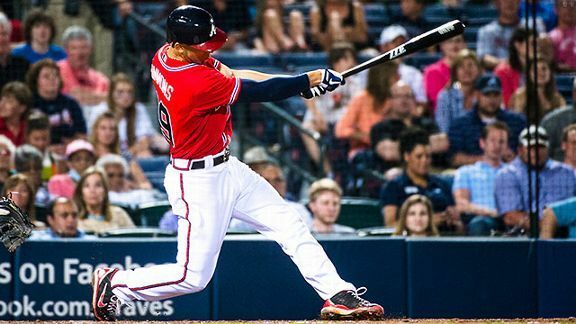 Expect many quick innings when the Braves face the bottom of the Dodgers’ lineup. While no individual player can touch Simmons defensively, as teams the Dodgers and Braves grade out similarly in the field; they’re both above average. The Dodgers have one more advantage: Their pitchers can hit. Kershaw batted .182/.241/.260 this year, Ryu hit .207/.233/.293, and Greinke did his best Tim Raines impression, batting .328 with seven walks and even two steals.2 The odds are good that, at some point in the series, a Dodgers pitcher will help his own cause at the plate. Greinke is just the second pitcher since World War II with two steals and an OBP above .400. During the regular season the Braves outscored the Dodgers by 39 runs, but even with Kemp out the presence of Puig and Ramirez in the lineup closes the gap and makes this matchup too close to call. Kimbrel is the bullpen version of Kershaw: Not only is he the best in the game at what he does, he has also ascended to a level that few practitioners of his craft have ever reached. Among all NL relievers with 40 innings this year, Kimbrel had the lowest ERA (1.21) and the third-highest strikeout rate (37.9 percent of batters faced). He was better in both categories a year ago, when he posted the highest strikeout rate (50.2 percent) in major league history. He has a 1.39 career ERA. That’s … not normal. As sublime as Kimbrel is, the Braves don’t have a big edge in the closer department, because Jansen is almost at Kimbrel’s level. Jansen, a converted catcher, had command issues at the start of his career (41 walks in 81 innings in his first two seasons), but has walked just 40 batters in 142 innings over the last two years while continuing to breathe fire and crap lightning. Jansen, in fact, is one of the two pitchers with a better strikeout rate (just barely, at 38.0 percent) than Kimbrel this year. Among all pitchers in major league history with 100-plus innings, Kimbrel has the highest career strikeout rate, and Jansen has the third-highest. (Aroldis Chapman is second.) Don’t expect a lot of ninth-inning comebacks in this series. Both middle relief corps are solid, if not excellent. The Dodgers probably have the slight advantage when it comes to playing matchups, because both of their left-handers were death against left-handed batters. J.P. Howell held lefties to a .164/.225/.227 line, while they hit .131/.218/.182 against Paco Rodriguez. Brian Wilson is a wild card; the former Giants closer has been excellent since his return from Tommy John surgery, but has pitched only 14 innings so far. The Braves counter with Luis Avilan, who has a 1.69 career ERA3 and has been even tougher on left-handed batters this year (.144/.219/.163) than Howell or Rodriguez. But Avilan has struck out 38 batters and allowed just one homer in 65 innings, both numbers strongly suggesting he’s been the beneficiary of some crazy good luck this year. Alex Wood is a lefty swingman who moved to the bullpen in anticipation of the playoffs and could emerge as the key bridge between the starters and Kimbrel. Kimbrel’s 1.39 career ERA is the lowest in major league history among pitchers with 100-plus innings. Avilan’s 1.69 career ERA is second. 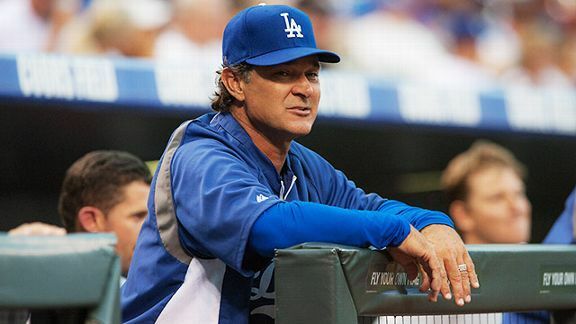 Don Mattingly went to the playoffs only once in his playing career, and has never made it to the LCS round. He has weathered a phenomenal amount of turmoil during his tenure with the Dodgers, from the Frank McCourt Follies to this year’s 30-42 start that reportedly had him just days from being fired. There’s nothing remarkable about Mattingly from a tactical standpoint, but he certainly deserves credit for presiding over a remarkable midseason turnaround. He has managed Puig about as well as he could, letting the rookie exhibit his talent and exuberance on the field while reining him in whenever that exuberance threatened to cause an incident. Fredi Gonzalez has improved considerably as a tactical manager since the Braves hired him before the 2011 season, and has shown a steady hand in developing young players like Simmons, Teheran, and Freddie Freeman the last three years. Neither manager is Earl Weaver when it comes to in-game strategy, but neither is likely to make a truly boneheaded mistake, either. The Braves won 96 games to the Dodgers’ 92, but this Dodgers’ roster bears less resemblance to the team that started 30-42 than to the team that finished 62-28. While the Braves have home-field advantage, the Dodgers have the better starting pitcher in every matchup, with the possible exception of Game 3. They also have Kershaw set to start twice if necessary, and the Braves aren’t going to beat Sandy Koufax twice. Bonus prediction: Given the way the Braves react to opposing hitters who take their sweet time at the plate after hitting a home run, we can fully expect a Puig bomb to lead to a brawl that looks like a deleted mission from Grand Theft Auto V.
In Tuesday night’s wild-card game, the Pirates showed the rest of baseball that they deserve to be taken seriously as playoff contenders. Meanwhile, Pirates fans showed the nation that they have emerged from hibernation, and they are rabid. The Cardinals and their fans, meanwhile, have been here before: St. Louis has qualified for the playoffs 10 times in the last 14 years, and this is the Cardinals’ 21st postseason series of the 21st century. Yadier Molina has played more postseason games (63) than every hitter on the Pirates’ Tuesday roster combined (53, and that includes the wild-card game). The Pirates bring passion; the Cardinals counter with experience. The great thing about baseball is that sometimes youth is served, and sometimes wisdom prevails. The Pirates won’t be able to start the series with Liriano, who pitched Tuesday and dispatched the Reds, but there’s more where he came from. Burnett has proven once again that a Steinbrenner’s trash is another team’s treasure, tying his career low with a 3.30 ERA and setting a career high with a 26.1 percent strikeout rate. Meanwhile, Cole has pitched like we’d expect the no. 1 overall pick from the year before to pitch: He’s been awesome. Along with Liriano, the Pirates have three well-above-average starters, but in a playoff series a team had best have four. Morton returned from Tommy John surgery early this year with his sinker intact, and when he’s getting ground balls, he can pitch with the best of them for six innings at a time. 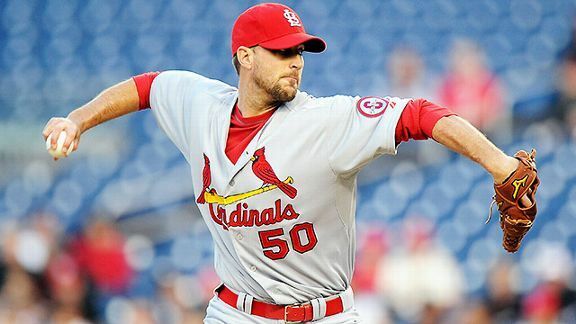 Wainwright returned from Tommy John surgery last year and wasn’t 100 percent himself in 2012. He was this year, though, leading the NL in innings, complete games, and shutouts, and I suppose I’ll mention that he led the league in wins as well. He set a career high in strikeouts while cutting his walk rate by a third. He’s an ace. Behind him, though, the Cardinals’ rotation is a touch weaker than Pittsburgh’s. Lynn is a solid no. 2 starter, and Miller was every bit as effective a rookie starter as Cole. But Miller started to fade late in the year — in September, he had just 15 strikeouts against 13 walks — and he has already thrown 23 innings more than his previous career high, which makes fatigue a real possibility. Kelly had a pretty ERA, but posted the peripheral stats typical of the no. 4 starter he is. The Cardinals have the best starting pitcher in this series, but the second-, third-, and fourth-best starters are all on Pittsburgh’s side. The Pirates have a slight — very slight — edge here. The Pirates finished just ninth in the NL in runs scored, but their lineup, as presently constituted, is a little better than that. McCutchen might win the MVP award, and the two guys batting behind him are better than the guys they were acquired to replace in August. Despite playing in a pitchers’ park, the Pirates finished third in the NL in homers, and Justin Morneau and Marlon Byrd both help in that regard. The combination of good pitching and cooler weather makes it tough to sustain rallies in October, so having a lineup full of guys who can create runs with one swing is an asset at this time of year. In the years for which we have play-by-play data — roughly since World War II — no team has posted as high of a batting average with runners in scoring position as the 2013 Cardinals. They obliterated the record by 18 points — the gap between the Cardinals and the second-place 1950 Red Sox is larger than the gap between second place and 40th place. That’s a remarkable achievement, but it’s also unsustainable. There is no evidence that hitting with runners in scoring position is an ability above and beyond hitting in all situations. With runners in scoring position, the Cardinals’ BABIP was .377, a ridiculous number that implies a whole hell of a lot of luck. The Cardinals did a phenomenal job of bunching their hits together, allowing them to score more runs than they would have otherwise. Their wRC (weighted Runs Created), an estimate of how many runs the Cardinals should have scored based on their number of singles, doubles, etc., was 715. They actually scored 783, 68 runs more than expected, a historically high margin. Basically, what this means is that the Cardinals’ offense isn’t as good as it appears. The Cardinals outscored the Pirates by 149 runs, but based on wRC, they should have outscored Pittsburgh by only 58 runs. (The Pirates were slightly unlucky by this method.) The Cardinals’ bats are better; they’re just not that much better. The Cardinals’ offense is also highly dependent on balls in play to succeed. The Cardinals were second in the NL in singles and first in doubles, but were just 13th in home runs. The Pirates, who have a sensational defense (third in the major leagues in Defensive Runs Saved) and who aggressively use defensive shifts to gain an edge, are a poor matchup for them. The Cardinals themselves have a below-average defense, even factoring in Molina. The Cardinals are also down one of their best hitters, as Allen Craig, who hit .315/.373/.457 this year, will miss the series with a Lisfranc injury in his foot. This doesn’t affect the lineup much at all,5 since the Cardinals can plug in Matt Adams and not miss too many beats. Although no one hits better with runners in scoring position than Craig, who hit .454 in those situations this year. Craig’s .394 career average with runners in scoring position is 40 points higher than any other player’s with 200 at-bats in those situations since World War II. The ripple effect of losing Craig is that moving Adams into the lineup strips the Cardinals of their best pinch hitter. Actually, it removes their only pinch hitter. Their bench is just awful. Shane Robinson (.250/.345/.319) is probably their best pinch hitter now; backup catcher Tony Cruz (.203/.240/.293) might be next in line. It’s bad enough that the Cardinals don’t have any good options to pinch hit for their pitchers, but they also really need pinch hitters for two positions, because shortstop has been a pit of desolation for the team all season. Pete Kozma hit .217/.275/.273 with defense that was so bad it finally forced the Cardinals to bench him in favor of Daniel Descalso, who didn’t hit much better and had played mostly second and third base before this season. The Cardinals have two automatic outs in their lineup, and their bench options are so bad that Wainwright (a career .205/.232/.301 hitter) is likely to be used as a pinch hitter at some point in the series. 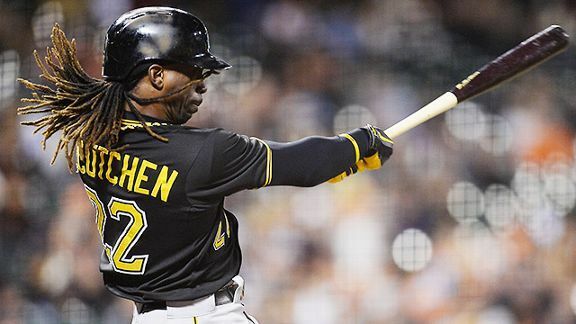 The Pirates, by comparison, can turn to Jordy Mercer (.285/.336/.435) or Garrett Jones (.233/.289/.419) or Gaby Sanchez (.254/.361/.402) or Jose Tabata (.282/.342/.429) when they need a bat off the bench. The Cardinals have the better offense. But the gap is not nearly as gargantuan as the runs-scored column seems to indicate. The Cardinals’ bullpen is impressively deep; we’re showing only five relievers apiece here, which means we don’t have room for Michael Wacha (who zoomed to the majors less than a year after he was drafted and posted a 2.78 ERA) or John Axford (who pitched his way out of the closer’s role in Milwaukee but allowed just two earned runs in 10 innings after the Cardinals traded for him at the end of August). There’s a change at the back end of the bullpen, where Mujica lost the closer’s job in September, thanks to a .514 batting average against him during the month. The Cardinals’ new playoff closer is Rosenthal, a rookie with three career saves entering the postseason. If that sounds familiar, that’s because in 2006, the Cardinals’ new playoff closer was Wainwright, a rookie with three career saves entering the postseason. That year, St. Louis won the World Series. If they need a double play, the Cardinals can turn to Maness, who posted a ridiculous 68.4 percent ground ball rate this season. If they need a strikeout, they can turn to flamethrower Carlos Martinez, who touches 101 on the gun. Choate is such the quintessential lefty specialist — 70 percent of the batters he faced this season were left-handed, and he averaged just 2.2 batters per appearance — that it’s a minor miracle he never pitched for Tony La Russa. Siegrist threw the most innings (39.2) in major league history of any pitcher who allowed two runs or fewer. The Pirates’ bullpen is good but not great, particularly since neither Grilli nor Melancon were at their best late in the year. The Cardinals have the decided edge in any game that’s tied from the seventh inning on. 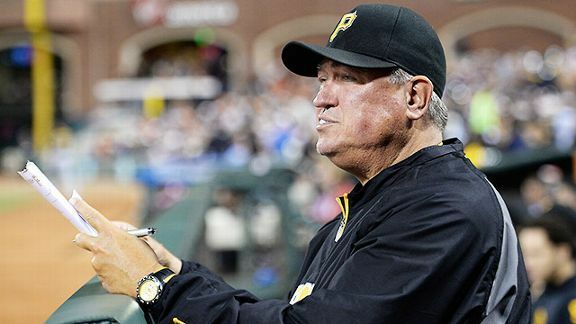 This is Clint Hurdle’s 11th season as a major league manager, and he’s had only one winning season before this one — but that was 2007, the year of Rocktober, when his Colorado Rockies won 14 of 15 games to sneak into the playoffs as the wild card, then ripped off seven straight wins to reach the World Series. Hurdle manages conventionally aside from embracing the move toward aggressive defensive shifting this year, which has paid significant dividends. Mike Matheny has tough shoes to fill in St. Louis, and while he has been a worthy successor to La Russa in terms of setting the clubhouse culture, so far he has not shown himself to be at La Russa’s tactical level. Matheny would be well advised to take a page from La Russa’s magnum opus, the 2011 postseason, when (like this year) the Cardinals had a deep and effective bullpen but only one top-of-the-rotation starter. La Russa’s response was to let his ace, Chris Carpenter, work deep into games, and then to pull his other starters at the first sign of trouble, often in the third or fourth innings. The Cardinals famously got more innings from their relievers than their starters in the NLCS, and for the postseason as a whole their starters averaged just 5.11 innings per game. If Matheny rides Wainwright deep into games but pulls his other starters at the first sign of trouble, he can use converted starters like Wacha and Martinez for multiple innings and then let Siegrist and Rosenthal clean up at the end. But Lynn, Miller, and Kelly pitched well enough this year that Matheny will probably give in to temptation and leave them in, which will keep the Cardinals’ biggest advantage in this series — their bullpen — off the field. If Matheny deploys his bullpen early and often, the combined advantages of the Cardinals’ relievers and their lineup may swing the series in St. Louis’s favor. But the Pirates have the better starter in Games 2 and 3, and the ground balls that found holes and the fly balls that dropped in for the Cardinals all year long are likely to find gloves in this series. If the Pirates get out to an early lead, the two holes in the Cardinals’ lineup and the lack of better options off the bench will make it difficult for St. Louis to come back. Dream on, Pittsburgh. Buc-tober ain’t over yet. Prediction: Pirates in four games.